The chart on the left includes federal funding, while the one on the right shows how states would distribute resources absent federal involvement. Perhaps the most striking thing about these charts are the states where the local system is super-regressive, while the state system compensates by being hyper-progressive. 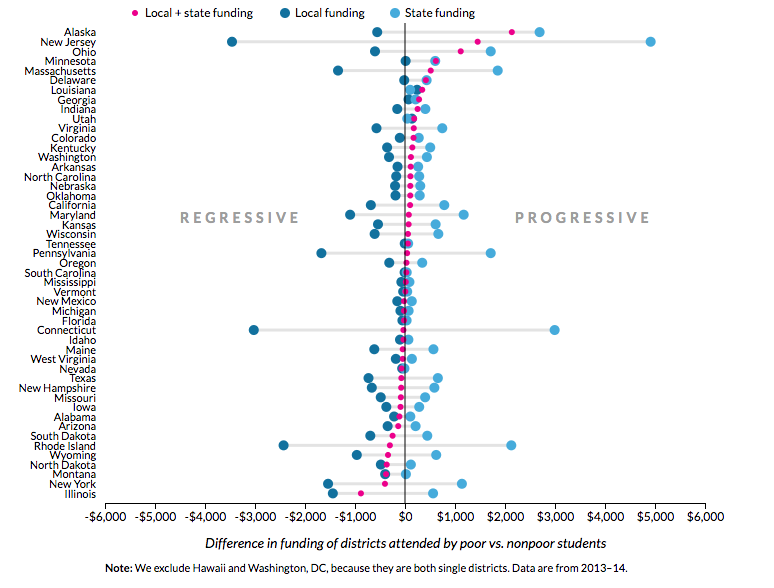 At the risk of oversimplifying the analysis here, those seem to be places where socioeconomic segregation and opportunity gaps are high; where districts are small and plentiful; and tax policy at a statewide level reflects some level of equity. Those states are concentrated in New England and the Mid-Atlantic, and the level of intra-state division in these places is remarkable. I'd love to hear how other folks interpret these results, and whether there are any big themes I'm missing. Although our organizations have sparred and disagreed over the years, such is the danger to public schooling posed by Trump’s embrace of vouchers that we are speaking out together on this issue. The Trump-DeVos effort to push vouchers, or something equivalent through tax credits, threatens the promise and purpose of America’s great equalizer, public education. At a time when low-income children make up the majority of public school students, we as a country must do more to support families, teachers, administrators and public schools. Trump’s plan would do the opposite. While many of my own friends and colleagues seem comfortable working within this dynamic and are ready and willing to embrace union leaders when it suits them, I simply refuse to go there. Unions exist to put the interests of adults first. As a former member of the teachers’ union, I have seen it first hand. Randi Weingarten’s primary responsibility is to her members and those members all happen to be grown ups. So when the interests of children and the interests of the grown ups are at odds, which happens very often in education, Randi will adhere to her job description and protect the adults. At the expense of kids. Every single time. Sanzi is correct that Weingarten's legal obligation is to protect the interests of her members, and at times those interests do not intersect with those of children and families in public schools. I'm worried that Sanzi's final point overstates the issue, though, and I also worry that Weingarten and Edelman are elevating the voucher fight beyond where it needs to be in the public consciousness, which is counterproductive. The antagonistic formulation above is a recipe for another decade of educational gridlock, which would be a giant waste of time and energy. Vouchers constitute a tiny part of the overall education policy landscape, and there exists little evidence that the Trump-DeVos administration has either the inclination, or the skill, to expand vouchers in a way that would truly undermine the foundations of public schooling. Choice advocates and the unions alike should spend 1000% less time sniping over the voucher issue, and 1000% more time improving the overall quality of charter and traditional public schools.